Unlike the limited edition Balmoral Añejo 18, the XO doesn’t state the exact age of its Brazilian Arapiraca wrapper. However, we’re told the wrapper, the Dominican binder, and the filler tobaccos from Nicaragua, Brazil, and the Dominican Republic are all “eXceptionally Old,” hence XO. The large robusto (5 x 55) performs flawlessly with a solid gray ash, straight burn, and an open, easy draw. I’d classify the XO’s flavors as muted and subtle, but also complex. There’s a rich creaminess, raisin bread, and just a hint of wood and cinnamon spice. This is the type of cigar I’d smoke with a rich cup of coffee or a balanced brown ale. For quite some time, Villiger, a big player in the machine-made cigar realm, has been attempting to gain a foothold in the premium, hand-rolled market. On the tobacco front, Villiger has introduced cigars, such as Trill and Cabareté, that didn’t feature the Villiger name. And it’s tried with cigars that do, like the Villiger San’Doro. In a June interview with Cigar Snob, Villiger North America president Rene Castañeda said 2016 production for each of the lines will be about 25,000 for U.S. sales, with a focus on Florida, California, and the New York-New Jersey-Pennsylvania market. The San’Doro Maduro features a Mata Fina wrapper, Mata Norte binder, and Mata Fina and Mata Norte filler. I smoked three samples, which were sent to me by Villiger. 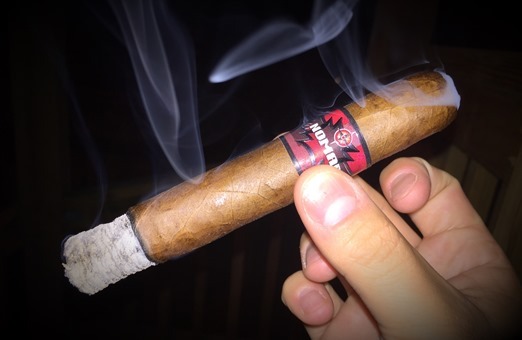 The cigar makes a strong first impression, with an oily wrapper and a heavy feel. The denseness made me wary of a tight draw, but that proved not to be the case. The cigars did, however, start with fairly airy smoke that gradually gained substance. It also burned very slowly, making the six-inch smoke last as long as most cigars an inch or more in length. Villiger promotes the Maduro as the strongest of the San’Doro lines. I’d put it as medium strength and body. There are many of the typical Maduro flavors, such as coffee and chocolate. It also has a pleasant mix of sweetness and a little spice, with some nuttiness and some wood and leather. The flavors mix and mingle throughout, keeping it interesting along the way. If you haven’t tried a Villiger cigar, this is a good place to start. I rate the San’Doro Maduro four stogies out of five. About a month ago, right after LeBron James delivered the Cleveland Cavaliers their first title in the franchise’s 46-year history, pictures and video began to surface of the NBA Finals MVP with a cigar. Since it wasn’t easy to discern the band, I recall seeing some speculation on social media about what cigar LeBron had chosen to celebrate. Several people seemed quite certain it was a Hoyo. The cigar brand was later correctly identified as Y.O. by Yaxel Ortiz. I think it’s safe to say this choice caught many people by surprise. Even many of those who are regular smokers and enthusiastic readers and followers of the world of cigars had never heard of the brand. How it got on LeBron’s radar—or how the cigar in question made its way to him—is not known. An employee of Cousin’s Cigar, a five-location tobacconist in the Cleveland area, sent me a handful of Yaxel Ortiz Y.O. Toros, along with information about the brand. Yaxel Ortiz, for instance, has been working with tobacco for a quarter century and has been making cigars in the U.S. for years. Recently, he opened his own factory in Estelí called The Best Cigars S.A. It is there his first Nicaraguan-made cigar is crafted. Y.O. has been on the market for about nine months and is available at about 30 stores across 9 states. Its recipe includes an Ecuadorian Habano wrapper around Nicaraguan binder and filler tobaccos. Four sizes are available, each of which is affordably priced: Robusto (5 x 50, $5.20), Torpedo (6.5 x 52, $6.50), Churchill (7 x 50, $6.50), and Toro (6 x 52, $5.90). Beneath the glossy band of black and gold that was the subject of much speculation and head-scratching is a silky, oily, slightly reddish wrapper with thin veins and moderate tooth. The several Toros I smoked for this review all had a few lumps here and there, along with a spongy feel. At the foot, the sweet pre-light notes are reminiscent of mocha and caramel. On the palate, after an even light is established, medium- to full-bodied flavors of black pepper, coffee, and dark chocolate waste no time introducing themselves. The texture is thick and leathery, and there is a little cayenne heat on the finish. After a quarter inch, the intensity fades a bit, a retreat that paves the way for some creaminess and sweetness to enter the equation. The midway point is lighter on spice and flatter in character with oak, creamy nougat, and bread. Now decidedly medium-bodied, the texture is less leathery and chalkier. The finale witnesses a reprise of some of the initial intensity. Despite the cigar’s sponginess—which, in my experience, can often portend construction issues—the Toro exhibits excellent combustion properties. Each of my samples had a straight burn, solid ash, smooth draw, and above-average smoke production. One would think LeBron wouldn’t need to concern himself with cost, especially when selecting a celebratory smoke for one of the greatest accomplishments in his storied career. You and I, on the other hand, are likely in a different boat. So the price points across the Y.O. range are certainly welcome and highly appreciated. As far as the Toro is concerned, it won’t knock your socks off with flavor or complexity. But it will deliver a consistently enjoyable experience that’s worthy of a solid rating of three stogies out of five. I’ve had this Cuban puro resting in a tube in my humidor for at least a few years. 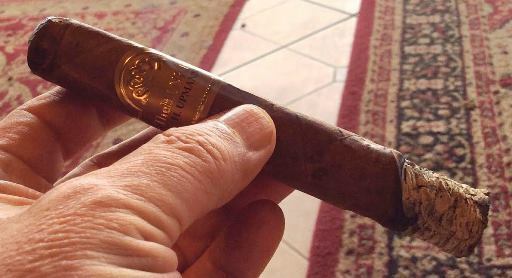 With all the new non-Cuban cigars being introduced this week at the IPCPR Trade Show in Las Vegas, I decided to check out a Cuban that is anything but new. (Of course, if the cigar could legally be sold in the U.S., it would not be grandfathered as exempt because it was not sold or marketed in the U.S. in 2007.) This pirámide is medium-bodied with a typical Cuban profile with cedar, leather, roasted nuts, and just a bit of woody spice. Although he foot of the cigar has been a little beat up by the metal tube (something I’ve seen before from these) construction was generally without incident. This limited edition from Altadis is a standout, far from the stereotype of cigars from an industry’s giant. It’s rich, complex, and nicely balanced with a Criollo ’98 wrapper and Nicaraguan binder and filler. Issued in a single size (6 x 54) with 4,500 eight-count boxes shaped like gold bars, the single-stick MSRP is $9.25. I did experience some minor meandering burn issues and a flaky ash, but the spicy, sweet, and shifting flavors more than made up for it.